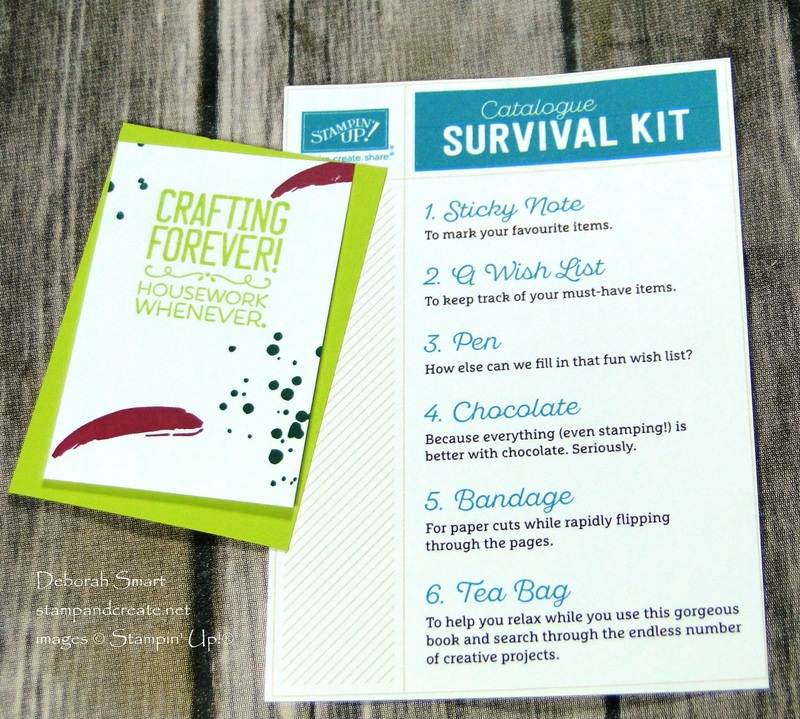 I’ve put together these fun ‘catalogue survival kits’ myself in the past; this was the first year that Stampin’ Up! actually created a form that we could print off & use! That was very helpful for me, especially with my lack of time. I used a regular brown paper lunch bag, and stamped it using the fun new Crafting Forever stamp set. You’re going to love this set! 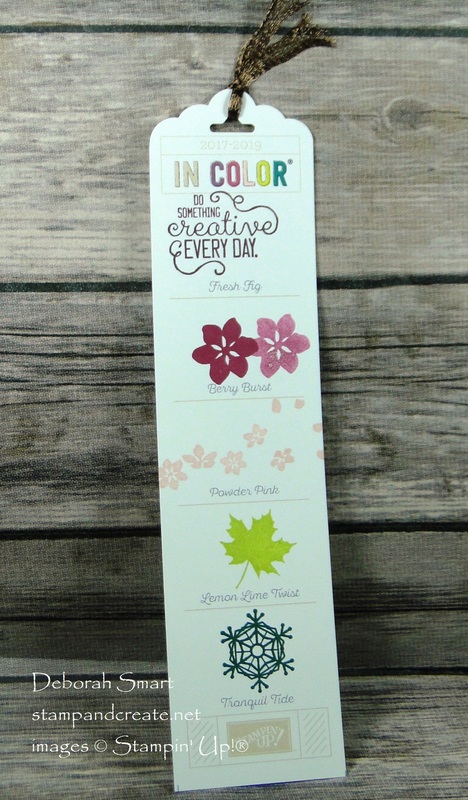 It not only has great images and sentiments, but it also fulfills the Stampin’ Up! Angel Policy. (you can read more about the Angel Policy HERE). You can see that I used the new In Colors for stamping; Berry Burst for the pot, Tranquil Tide for the ink spots, Lemon Lime Twist and Berry Burst on the fun tage that I made. I’m pretty sure that everyone’s favourite part of the kit was #4 – the chocolate! 🙂 I thought that the sentiment I used on the tag was very appropriate – what do you think? Well, I’m sorry to say that this girl was NOT on top of her game – I totally forgot to take pictures of my displays, the setup, and pictures of everyone having fun! I know, right?! BUT – I did take pictures the next day of the card everyone and bookmark that everyone made, as well as the new cards cards I had displayed. (you just don’t get the full ‘display’ effect). Again, this is the first year that Stampin’ Up! created a bookmark form for all us demonstrators to use. I’ve always made my own in the past – again, what a time saver! Isn’t this cute?! The sentiment at the top is also from the Creative Forever stamp set; the rest of the images are from the Colourful Season stamp set – another one that I know you’ll be adding to your ‘must have’ list. With the Berry Burst flowers, I had everyone stamp 1 flower ‘full strength’ ink, then immediately stamp a 2nd flower without re-inking, so that they could see how the colour can be softened, just by stamping off once. After stamping, the Scalloped Tag Topper Punch was used for the top, and then some of the new Copper Trim threaded through. As I said earlier, the Colourful Seasons stamp set, with it’s coordinating Seasonal Layers Thinlits Dies is going to go straight to the top of your ‘must have’ list! It has an entire Color Theory Suite of products that coordinate with the set – and you can Bundle the stamp set and Dies, and SAVE 10%! 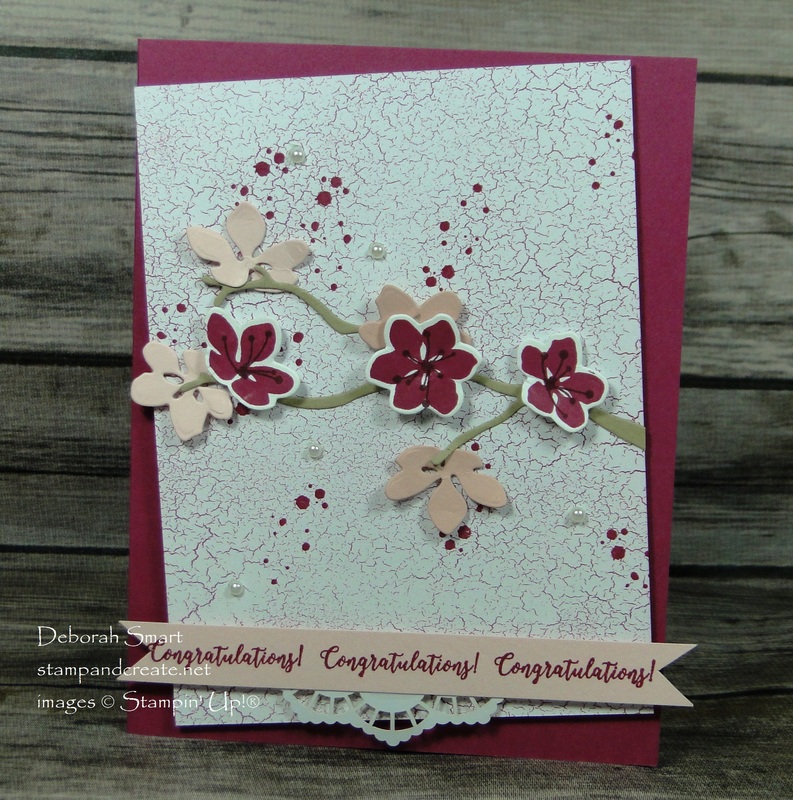 Other than the sentiment onto Blushing Bride cardstock, and Berry Burst flowers onto Whisper White, there was no other stamping done on this card except for the ink spots! The rest of the work is done by the amazing Seasonal Layers Thinlits – the branch in Crumb Cake, the flowers in Blushing Bride and Pink Pirouette card stock. 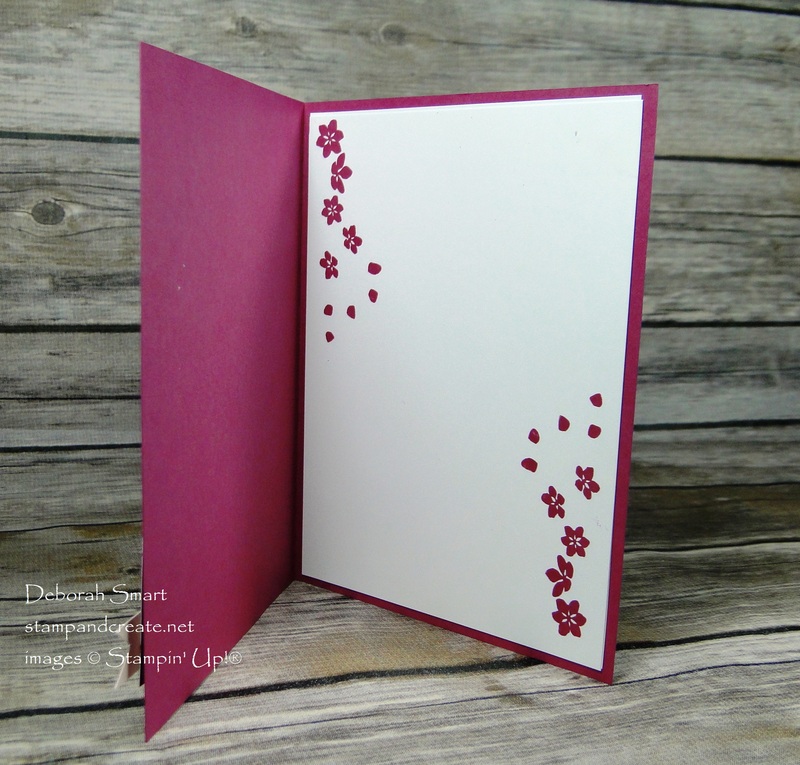 The card base is Berry Burst cardstock, with a panel from the Colour Theory Designer Series Paper Stack. (yes, you’ll want this, too!) Using Paper Snips, I cut banner tails on each end of the sentiment strip, and also cut a doily into 1/4. After gluing the doily piece to the back of the sentiment, it was attached to the panel with Stampin’ Dimensionals, which was in turn attached to the card base, also using Dimensionals. Finally, a few Pearls were scattered across the front. 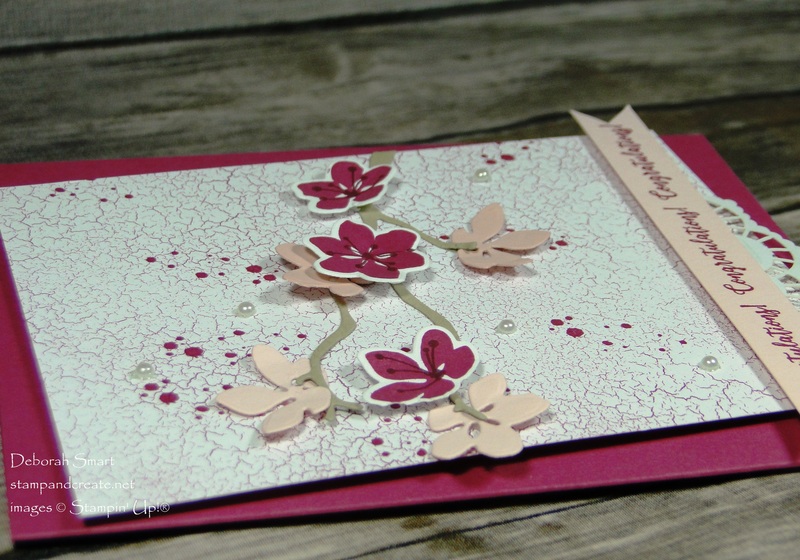 I love the dimension that the die cut flowers add the card. Of course, we can’t forget to decorate the inside panel, too! There’s no sentiment added inside yet, making it easier to use this card for any reason that requires ‘congratulations’. But I did stamp the flowers down each side of the panel, for an extra touch. You can order these products, and anything else from the new catalogue, in only 2 more days! While the ordering system transitions from the current to the new catalogue, the ordering system will be unavailable until 11 am PST. After that, I expect it to be very busy! In the meantime, you can still order from the current annual catalogue – there’s still lots of great deals to be had! To shop the Retiring Products, CLICK HERE. There’s also ONLY 2 DAYS LEFT to order the Special Eastern Palace Starter Bundle and Eastern Palace Premier Bundle! Everyone who orders the Premier bundle from me will also receive an invitation to a FREE card class, where we’ll make 3 cards using the bundle! For more information on these bundles, check out THIS POST, and CLICK HERE TO ORDER. If you are within Canada, you can order from me directly online – click on my signature below. If you’re in my area (Burnaby, BC) and would like a catalogue, just leave a comment on this post, and I’ll get in touch with you to arrange it! I am so sorry to hear about your dad. I hope he feels better soon. I love all your projects! They are awesome! 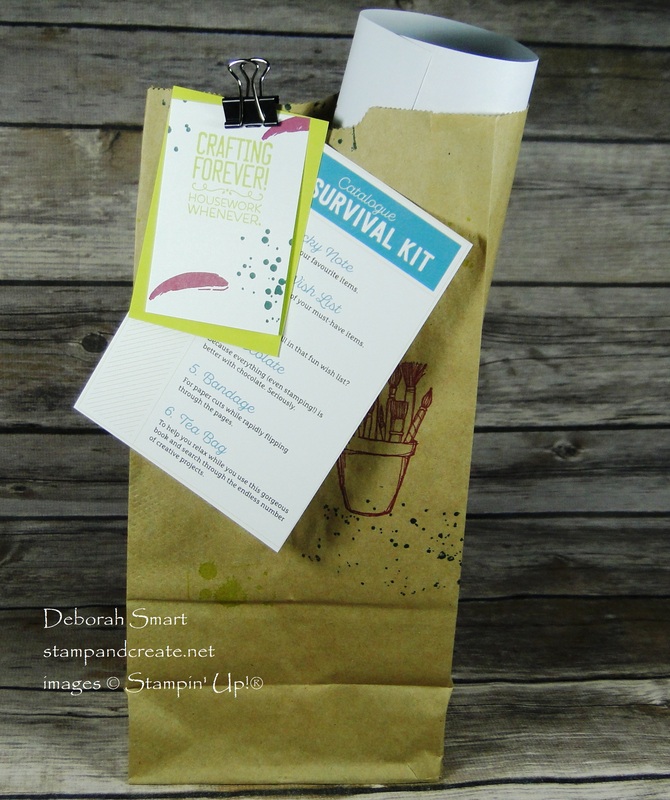 Love your survival kit – and the card is beautiful. Hope your dad is better soon – and good for you for putting family first! Thanks for your kind comment, Buffy! We did have fun at my Kick Off party 🙂 Fingers are crossed for my Dad’s health – I appreciate your good wishes.